Cee’s B&W Photo Challenge this week is ‘Looks like a face’. I immediately thought of Mr Leo lion who is always waiting on the boardwalk to greet us when we visit our local wildlife reserve. He looks kind of disappointed with his lot in life, but then I suppose we would all feel that way if we had hundreds of pairs of feet walking all over us every day of the week. Most folk wouldn’t even notice him, but I always stop and say “Hello” just to cheer him up a bit. This tree trunk in a park in Santiago, would also go unnoticed if someone with a sense of humour hadn’t decided to give it a rather agonized face. It reminded me of ‘The Scream’ the iconic painting symbolising the anxiety of modern man, by Norwegian Expressionist artist Edvard Munch. If you want to join in Cee’s B&W Photo Challenge, just click this link. 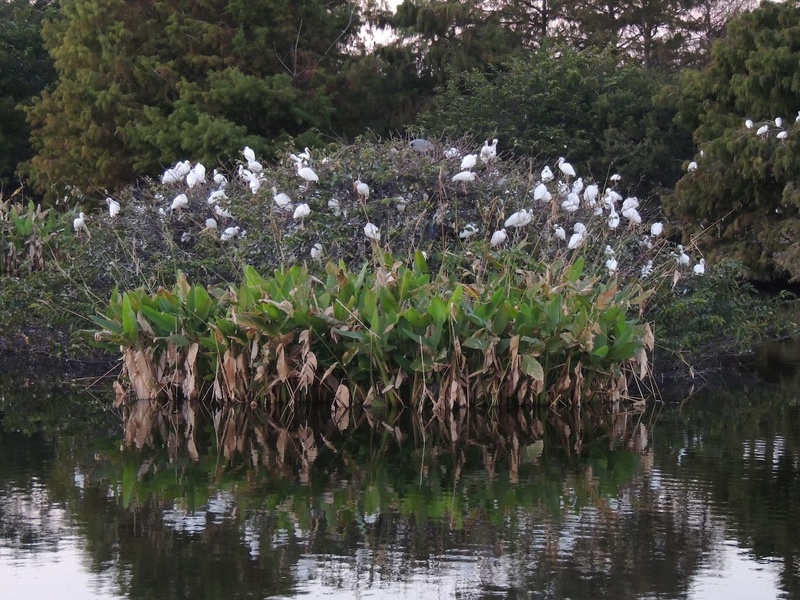 Mr. Great Egret goes out on a limb. Paula has a rather impressive image for her ‘Size’ theme, and invites us to post a photo showing her what we can come up with in terms of size. I’m always impressed when we visit our local nature reserve, at the sheer size of some of the camera equipment that people (mostly the really elderly) cart around with them. I saw one little old lady pushing hers around in a sort of stroller. My tiny camera is dwarfed by these giant zoom lenses. Paula was quite mischievous in the way she took her photo of Michelangelo’s David, so do pop over for a look. Hope you’re all enjoying a great weekend. Jithin of PhoTrablogger, invites us to find beauty in almost everything, and Jude of smallbluegreenflowers is on the lookout for beautiful wildflowers this month. At Green Cay we saw quite a few wildflowers and I think I can safely say that this is a wild Hibiscus. I think this could be Dogwood, also known here as ‘Appalachian Spring’. I’m sure Jude will know. This one looks to me a bit like Honeysuckle. Pretty in pink is all I can say about this one; maybe pink Statice? Here we have lots of pretty snowflake flowers. I really shouldn’t be sitting here guessing at wildflower names. I should be packing my case with slightly warmer clothes than I’m used to wearing her in Florida, for tomorrow we fly up to New Jersey to see our son and family. Little Taylor is going to be seven and is having a party at the weekend. We’ll be up there for a week, so as there are so many activities planned for whilst we’re there, I will of necessity be absent from the blogs during that time. I’ll tell you all about it next week. Take care and have a great week. Here is one of the beauties we saw at the Green Cay Wetlands reserve last Sunday. This Tri-colored Heron in all his glory, was looking for a hapless fish to spear with his long pointy beak. It didn’t take long before he was targeting his prey. Probably just a small minnow went down the hatch, but he strutted off looking very well pleased with himself. If you have any bird photos for Charlotte’s ‘Feather’s on Friday’ challenge, you’ll find her here. Wishing you all a splendid weekend. It’s hubby’s birthday on Sunday, so as a special treat, he’ll be getting to take the day off from his renovation work. What goes on in a ‘Bird Brain’? On Saturday afternoon, I spotted a Great Blue Heron sitting on a branch, looking down at the dead one floating in the water. He stayed very still for quite some time taking in the scene below him, before eventually flying away. 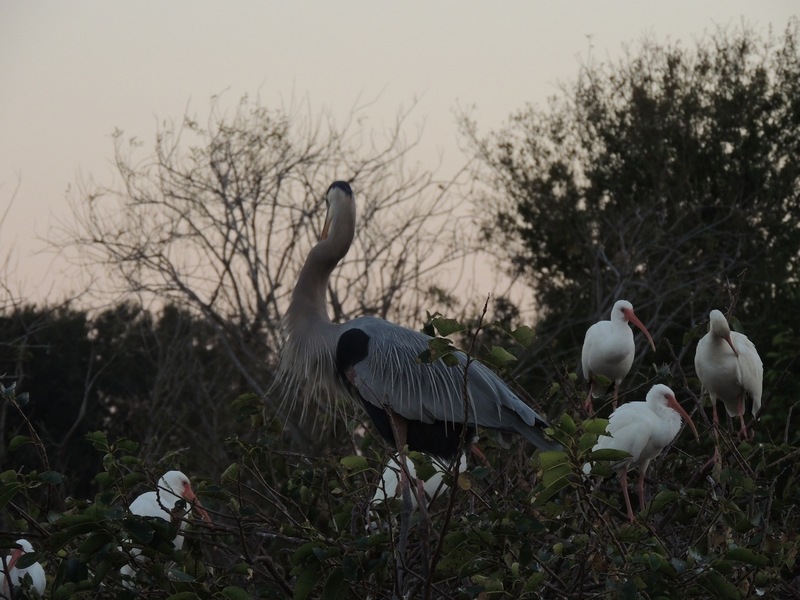 Last year at the Green Cay Nature Reserve, a Great Blue was standing motionless as if guarding the remains of another, absolutely undettered by the hoard of people taking photos of the pitiful scene. It made me wonder if birds do mourn their dead, just as we do. How little we know about the ‘inner lives’ of animals. I was just reading a fascinating review of a book by award winning environmental writer, Carl Safina ‘Beyond Words…..what animals think and feel’. It really sounds like an interesting read. I also found an engrossing article on Wiki about Bird Intelligence, which sheds some light on the subject. Hope you all had a great weekend. Our dinner with friends last night was sublime; delicious food and great conversation. Happy Monday to you. 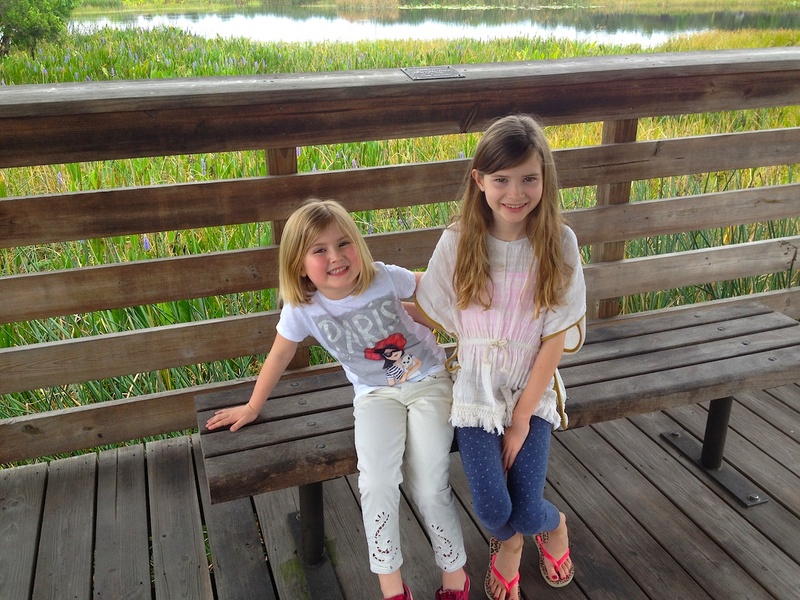 My two little granddaughters really enjoyed their visit to Green Cay Wetlands to see the wonderful wildlife here in Florida. There are several benches along the boardwalk for those who want to sit for a while to admire the view. Do you have any photos of occupied benches for Jude’s October Bench Series? Elaine of ‘I used to be indecisive’ blog, has nominated me to do the ‘5 Photos, 5 Stories’ challenge. My photo for the second day was taken when my granddaughters Sienna and Taylor came to visit a couple of weeks ago. 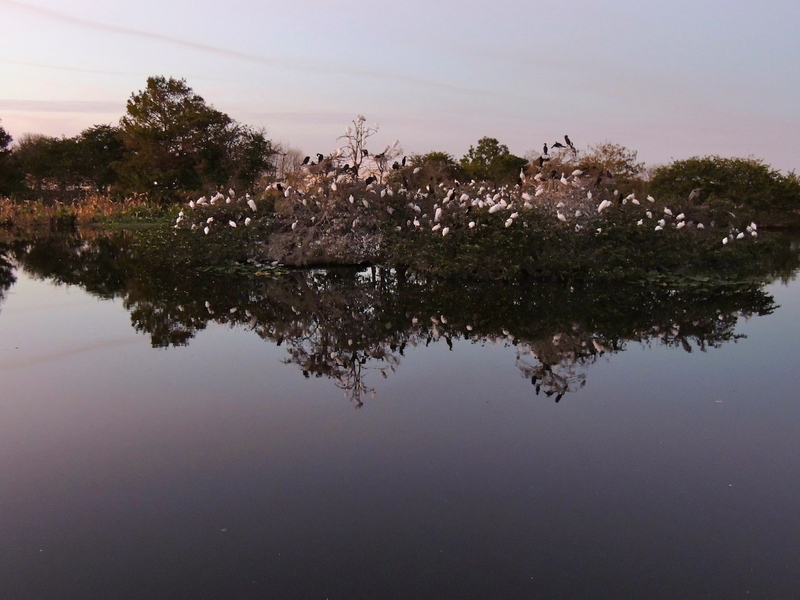 Hubby and I took them to the nature reserve which we often frequent. 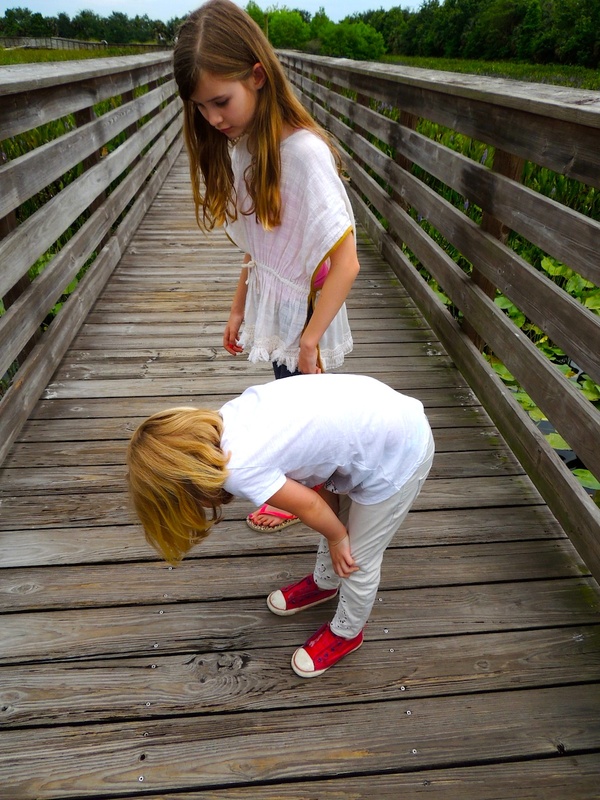 I was so happy to be able to introduce them to Mr. Leo the lion who lives in one of the boardwalk planks. Of course, they recognised him immediately. Can you see him? Today I would like to nominate Marylou of ‘natuurfreak’ blog to do the’ 5 photos, 5 stories’ challenge. I always enjoy seeing her nature photos, and I’m sure you will too. The challenge is quite simply to “post a photo each day for five consecutive days and attach a story to the photo. It can be fiction or non-fiction, a poem or a short paragraph and each day nominate another blogger for the challenge”. Of course there’s no obligation to do the challenge,; only if you would like to join in. 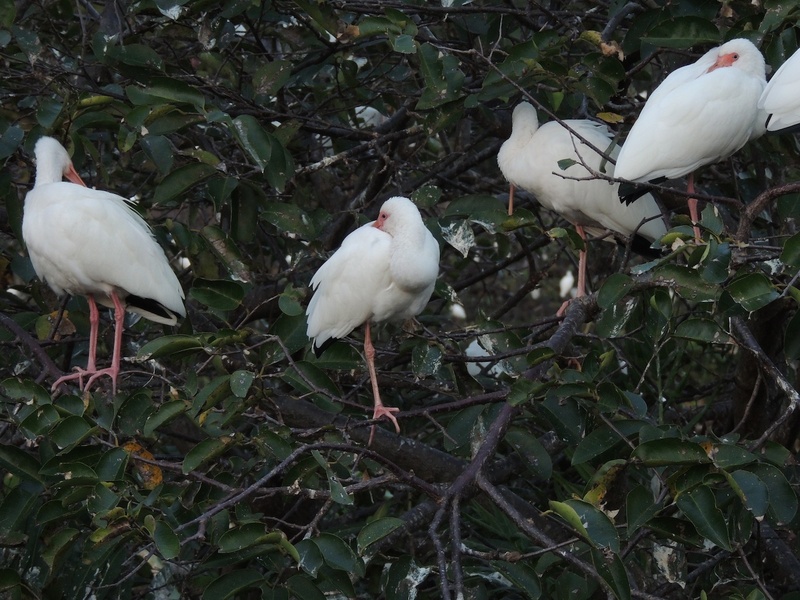 From a distance, it looks like the trees have a multitude of white blossoms, but on closer inspection, the white ‘flowers’ are revealed to be White Ibis. 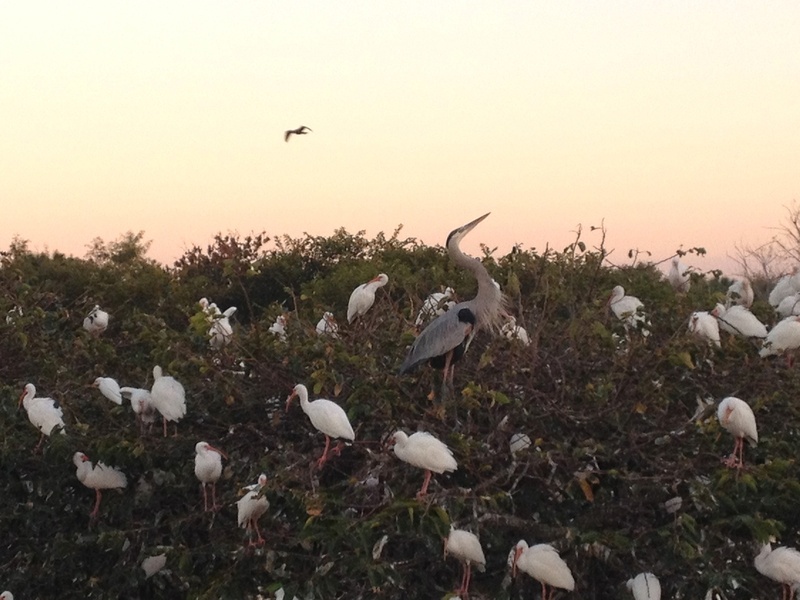 Almost every available branch in the marsh is covered in birds. but you can definitely see who’s the boss. Thanks to Paula for her Thursday Special Challenge. Click the badge below to participate.